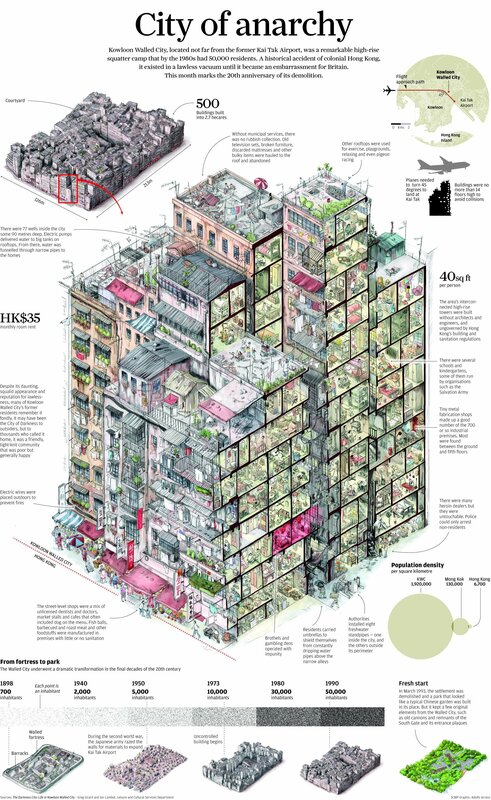 It's been 20 years (to the month) since Kowloon Walled City was demolished, but amazingly, it remains one of the most dense structures ever built. As many as 33,000 people crammed into the seven-acre plot, known in Cantonese as "the city of darkness," before they were relocated in 1993. This diagram, from the South China Morning Post, is an eye-popping reminder of one of the most legendary structures in the world. Nothing like it had existed before, and nothing has since. The Walled City was one of those urban anomalies that tend to pop up in disputed territories and borderlands. It began as a Chinese military outpost in the 1800s, and emerged as a kind of no-man's-land when England leased Hong Kong in 1898. The Japanese razed the site during World War II, and after the surrender, it became a magnet for refugees when neither England or China wanted to deal with the burgeoning, ungoverned community. 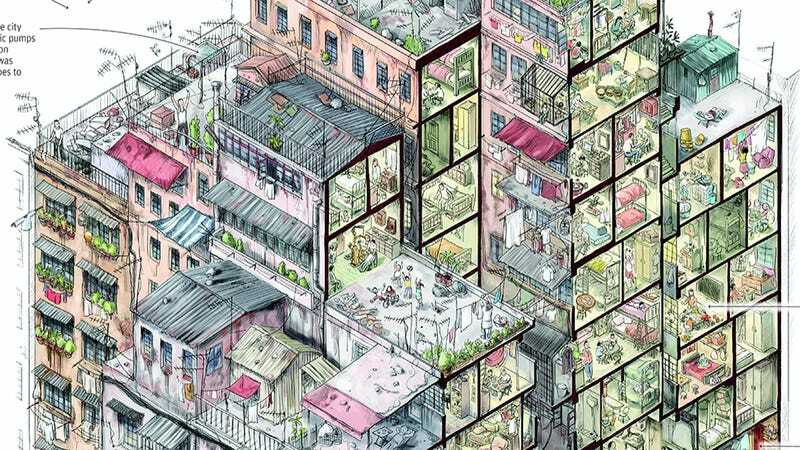 Kowloon Walled City, as we talk about it today, was born. There was a place near an airport, Kowloon, when Hong Kong wasn't China, but there had been a mistake, a long time ago, and that place, very small, many people, it still belonged to China. So there was no law there. An outlaw place. And more and more people crowded in; they built it up, higher. No rules, just building, just people living. Police wouldn't go there. Drugs and whores and gambling. But people living, too. Factories, restaurants. A city. No laws. The Walled City was often described as a cesspool ("den of iniquity" was another favorite), but at the same time, the community was a model for cooperation: residents created basic rules to deal with matters of survival, like fighting fires. Schools, shops, and businesses (including those of doctors and dentists who couldn't get licensed in Hong Kong) flourished. Crime was also a major problem, as you might expect—for a time in the 1960s and 70s, the Triads controlled the city. But as the SCMP describes, most former tenants remember it fondly. "We all had very good relationships in very bad conditions," one ex-resident says. "People who lived there were always loyal to each other. In the Walled City, the sunshine always followed the rain." In the mid-1980s, concerns over living conditions spurred officials to relocate the majority of residents, and only a few years later, the Walled City was empty. Most of the pictures and reports on the Walled City hail from the few years between the beginning of relocation and the razing of the structure, in 1993. Today, the site is a park—a bronze model of the city is all that remains of its former residents.